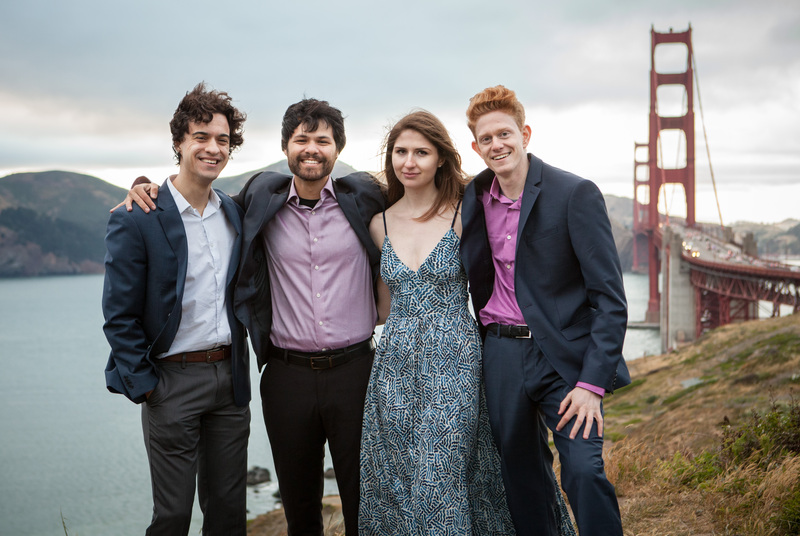 On September 29 and 30, Friction Quartet, the San Francisco string quartet specializing in contemporary works, celebrates its fifth anniversary with a pair of concerts at the Center for New Music. On Thursday, September 29 at 7:30 pm, they will premiere works by Stephen Feigenbaum and Loren Loiacano alongside a work by Philip Glass. On Friday, September 30, at 7:30 pm Friction will premiere works by Alex Van Gils and Piers Hellawell. These performances also mark the closing of Friction’s year long inaugural residency with the Center for New Music. Friday will feature the world premiere of A Sleeptalker Describes the Rising of the Seas by Alex Van Gils, a commentary on rising sea levels inspired by a vision he had of San Francisco’s skyline submerged in the surging ocean. Also programmed is the West Coast premiere of Driftwood on Sand by Piers Hellawell, Emerald Meditations by Ursula Kwong-Brown, and processed live-electronics piece, Hagiography, by Isaac Shankler. We invite you to join us at the conclusion of each performance to mingle with the artists over celebratory desserts.